This piece was done in May 2005. 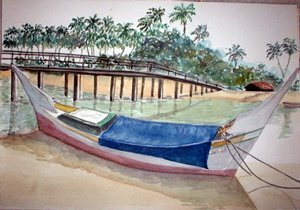 It was a picture of tranquil of a fisherman's boat resting beside an island off Marang in Kuala Terengganu. The bridge leads to the island. An artist friend who went ther recently told me that the sea has reclaimed the island and the bridge is but a sumberged wreck. Such is the nature of life, ever transient.